The term “flat feet” refers to a medical condition in which the arch of the foot comes into contact, or nearly in contact, with the ground when standing. Flat feet usually cause no problems for most people. But when they do, you need to take action. We routinely see this condition at our Philadelphia area foot and ankle practice. Sometimes this condition can lead to significant pain and reduced foot function. When this is the case, you should see a medical professional to diagnose the cause and recommend treatment to get you back on the road again. All babies are born with flat feet, but normally develop arches by the age of two or three. Some people never develop the foot arch in one or both feet, growing to adulthood with the condition. 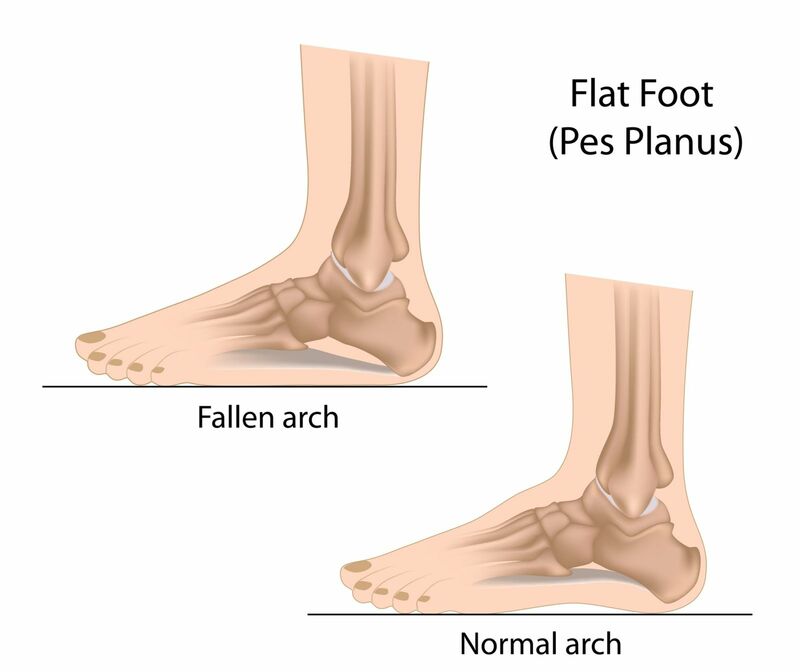 Sometimes age, certain injuries or illnesses may cause formed arches to flatten (called fallen arches). This is usually the result of a tendon injury and can happen on one or both feet. A rare condition called “tarsal coalition” can affect children and be very painful. This is caused by an abnormal growth or fusion of two or more foot bones when they grow together. Do Flat Feet Ever Need to Be Treated? People whose flat feet do not cause pain or discomfort often do not know that they have flat feet. But when your feet give you pain and limit your physical activity, it is time to see a doctor. A thorough evaluation by a professional is necessary to determine the source of the pain. There are numerous treatment options for flat feet. At Healthmark Foot & Ankle Associates, we can get to the bottom of your problem. We offer a full service, integrated approach to foot care. Serving the tri-state area of Pennsylvania, we have helped many people like you with their foot pain. Please contact us when you or a family member has trouble with flat feet. With three qualified, licensed Pennsylvania podiatrists and a friendly, knowledgeable staff, we can help you begin to heal. Call us today.